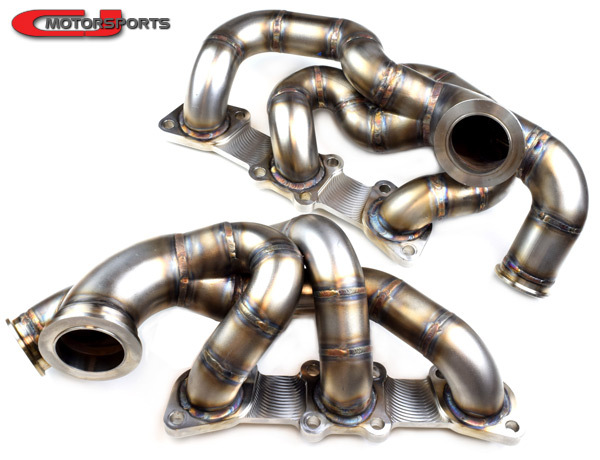 CJM tubular exhaust manifolds are now available for ordering. These manifolds are currently built-to-order and shipping is expected to take 3 weeks in most cases. Please read the Compatibility and Fitment Information below. Compatibility and Fitment Information: LH water pipe requires extensive modification (cut & weld). Sheet metal near the brake booster (LHD vehicles) requires minor push-in (dent), in a location not generally noticeable from above, to clear the wastegate runner. As with most VQ turbo manifolds, some exhaust manifold studs may need to be shortened. These manifolds were constructed on, and for, the 370z. They will bolt to earlier VQ engines, but Z33 chassis and steering shaft clearance clearance is currently un-tested. Intended for turbos with Tial turbine housings. This typically means Garrett GT & GTX turbochargers. Xona Rotor turbos also use Tial turbine housings. Compressor covers up to T04E will fit. This means up to GT30 will fit. GT35 requires the T04S covers to be replaced with modified T04E covers (available from ATP Turbo). Xona Rotor compressor cover fitment information is not yet available. 304ss Manifold Flanges, 1/2" thick.